“History will have to record that the greatest tragedy of this period of social transition was not the vitriolic words and the violent actions of the bad people, but the appalling silence and indifference of the good people. I first heard this quote in the 1989 Oscar Best Picture, Driving Miss Daisy, one of my all time favorite movies. This Dr. King quote was spoken by him from an old 1965 recording played during the movie. It sticks in my brain to this day. I always wanted to honor Dr. King, one of my biggest heroes, by being a ‘child of the light.’ Even more, I wanted to honor him with my best words actions when my era asks for tough decisions. We may not realize it, but with our e-mails, Facebook, Youtube, and other Social Media, our words are being recorded for history. Our children will judge us by the actions we do or do not take today on climate change. The opposite is also true. If you choose the wrong words and actions, it can also haunt you for a lifetime. Even worse, future generations could also judge you harshly. One person that will always be judged harshly by many people and even future generations is Hazel Bryan Massery. She is the 15 year old girl who walked behind Elizabeth Eckford, one of the Little Rock Nine, in one of the most famous photographs in history. The photo was taken on September 4, 1957. Hazel is forever seen in the black and white photograph with her teeth clenched and expressing a very angry insult at Elizabeth. In the same photograph, Elizabeth just stares ahead trying to ignore the unyielding and resistant mob. This assembled mob, including Hazel, does not want Elizabeth attending Central High School in Little Rock, Arkansas because of the color of her skin. For all of eternity, the photograph forces you to choose between good and evil, tolerance vs. hatred, and love vs. fear. The photo may be in black and white, but there are no gray areas to cling. The photo begs to ask the question: Did Hazel ever change her opinion? Does she still feel the same hatred today? For years, this question nagged at me. In January 2014, I took an amazing guided tour of Central High School National Historical Site with Ranger Jodi Morris. The visitor center sells a book about the two women, Elizabeth and Hazel: Two Women of Little Rock, by David Margolick. I bought the book and read it cover to cover within two days. I highly recommend the book because it did answer my perplexed questions of what became of Hazel and Elizabeth. It turned out that some good and healing did take place. Six years later, when no still or video cameras were around, Hazel did call Elizabeth to apologize. According to Marigolick’s book, Hazel was worried about her own legacy. She wanted to be a role model on racial tolerance for her sons that she never had herself. Even more bluntly, she did not want her sons to become the bigot she had been. When she found Elizabeth’s phone number and called her, Hazel identified herself as “the girl in the picture that was behind you yelling at you.” Hazel cried as she said she was sorry. She told Elizabeth what she had done was terrible, and she did not want her children turning out like that. Elizabeth graciously accepted Hazel’s apology. Elizabeth thought Hazel sounded sincere and so clearly craved forgiveness. The conversation lasted five minutes and then they went their separate ways. By 1990, Hazel took black teenagers who rarely left Little Rock on field trips to climb nearby Pinnacle Mountain and picking strawberries. She counseled young, unwed mothers, many of the black, on parenting skills. She became especially close with one mother, Victoria Brown and her six children. Hazel read up on the civil rights movement and even stood up to her own husband and mother when they made racist statements. Occasionally, Hazel would even tell friends she was that girl, always adding she was very ashamed of what she did. Hazel started doing public interviews in 1997 to respond inquires about the famous September 4, 1957 photo. Reporters often had a preconceived perception that Hazel would still be very racist, but they were surprised that she felt full remorse for her behavior. One reporter noted photo still seemed to haunt her and it would not let her go. Elizabeth and Hazel did meet around the 40th anniversary of the picture for a new reconciliation picture taken of the two of them in front of Central High School. Amazingly, they became good friends for awhile. They spent a lot of time together. They traveled, and spoke to school kids. Not just about that awful day in 1957, but about their respective backgrounds. They shared with students who they were then and how they had changed. “They were really kind of an amazing and inspiring couple,” David Margolick said in a 2011 NPR story, Elizabeth and Hazel. However, the dark legacy left by that picture never fully went away. Other members of the Little Rock Nine never accepted Hazel. They thought she was a publicity hound. The white alumni of Central High from the class 1957-58 doubted her sincerity and even resented it. Elizabeth grew to be mistrustful of Hazel. She felt that Hazel had not fully owned up to everything that happened in the past. On the other hand, Hazel felt like she did everything possible to recant, express remorse and work towards reconciliation with Elizabeth, but it was never enough. Their friendship dissolved and Hazel slipped back into her private life. Hazel liked to say that ‘A life is more than a moment.’ However, as this story shows, a momentary hurtful act can linger for a lifetime, even for generations and into perpetuity. The story of Elizabeth and Hazel reminds me why I want to do everything I can to reduce the impact of climate change. I want to be a child of the light that would make Dr. Martin Luther King, Jr. proud. With Facebook, e-mails, YouTube, and all these other forms of electronic media recording us, our children and grandchildren may know our words long after we are gone. They may learn what we knew about climate change, when did we know it, and what did we decide to do about it. In 1999, I read my first climate change book, Laboratory Earth: The Planetary Gamble We Can’t Afford to Lose by climate scientist Dr. Stephen Schneider of Stanford University. In the book, Dr. Schneider thought that that nature could provide us eventually with some ‘very nasty surprises’ if we continue our business-as-usual approach to burning fossil fuels. However, that is projections for the end of the century. Sadly, climate change is not just a future threat. It is happening right now before our eyes. The NASA website shows multiple lines of evidence indicating that human caused climate change is happening right now and is a serious threat. The evidence includes accelerated sea level rise, rising global temperatures, warming oceans, declining Arctic ice sheet, worldwide glaciers retreat, increase of extreme weather events and ocean acidification. One of the biggest worries for climate scientists are abrupt tipping points, where we blow past the point of no return. Scientists are still not even sure what they are and when we may encounter them, but why take that chance? These tipping points could be ice sheets on Greenland and Antarctica melting permanently, global food shortages and widespread crop failures with more extreme weather, rising ocean temperatures and acidity reaching triggering a crash in global coral reef ecosystems, and warming oceans push the release of methane from the sea floor, which could lead to runaway climate change, etc. In a 2012 scientific published paper, lead author climate scientist Dr. Tony Barnosky of the University of California Berkeley, suggests the world must currently reduce greenhouse gas emissions about 5 percent each year for the next 38 years to limit the average global temperature rise to 2 degrees Celsius. (3.6 degrees Fahrenheit). Above 2 degrees Celsius is considered to be the point of no return for many climate scientists. Therefore, we must act fast. We have no time to lose. The decisions we make today could impact us for generations. Yes, it is ultimately up to you and me. We must decide fast if we are not going to be like Hazel or the white mob in front of Little Rock High School who bitterly fought the necessary change. Or, will we be like President Eisenhower and the federal troops who took to the bold stand of action to usher Elizabeth Eckford and the other Little Rock Nine students inside the Central High School to start the process of racial integration. Just like that 1957 photograph with Elizabeth and Hazel, our children and grandchildren will judge us if we made the correct action we heard about climate change. As Hazel unfortunately learned during her life, history can make a harsh judgment against you if you make the wrong decision initially and then ask for forgiveness later. Even worse, history can still make a harsh judgment against you if you knew for years that climate change was a serious problem, but you were afraid or too pessimistic to act. In the 1950 and 60s, there was millions of southerners and Americans who knew that segregation was wrong, but they did not act. Dr. Martin Luther King, Jr. quote shows us that inaction in the face of reality is not acceptable. With the warnings we have received from climate scientists, the moral compass of Dr. Martin Luther King, and the lesson of Hazel, we must act now on climate change. Ok, Brian, you got my attention. WHAT ACTIONS DO YOU WANT ME TO TAKE ON CLIMATE CHANGE? I do encourage you to take the best effective action you can find to reduce the impact of climate change. 1. Engage your family, friends, neighbors, and co-workers on the subject of climate change. I have been so fortunate to communicate to others during the past four years as a public speaker, Toastmaster, Park Ranger, teacher at St. Louis Community College, volunteer for Sierra Club’s Beyond Coal Campaign, this blog, senior contributing writer to Climatebites.org, etc. 2. Educate yourself on the issue of climate change so you can hold your ground when friends and family make statements denying climate change. Familiarize yourself with the climate denial myths and educate yourself why they are wrong. The best source I know to do this is skepticalscience.com. Use Skeptical Science to well verse why the denier myths are wrong. Even more, I contribute writings to the website Climatebites.org, where we compile sound bite quotes, metaphors, and even jokes to counter denier myths. 2) to empower individuals to have breakthroughs in exercising their personal and political power. CCL’s mission is to successfully establish positive relationships with the media and members of Congress so they will pass a carbon fee and dividend. This will correct the current free market weakness of our atmosphere currently being used as an open sewer for greenhouse gas pollution. This tax would account for the true costs to society of this pollution and enable renewable energy to truly be competitive on a level playing field. Personally, I have been involved with CCL for nearly two years. They have really empowered me to be more effective as a climate activist by helping me create an active CCL group in southern Oregon. Eight major newspapers have also published my opinion editorials in the past year, one with the St. Louis Post Dispatch and seven in Oregon newspapers calling for support for CCL’s carbon tax. Because of CCL, I have also established a relationship with the staff of my Congresswoman, Rep. Ann Wagner. By getting to know her staff, my goal is to eventually have a face to face meeting with her to persuade to take action on climate change by supporting CCL’s carbon fee and dividend. 4. Join 350.org and their Go Fossil Free Campaign. I am a 1992 graduate of William Jewell College in Kansas City, Missouri. In this past year, I did just that I contacted a Jewell student, a professor, and Dr. Andrew Pratt, who administers Jewell’s sustainability program. I then had a phone conversation with Dr. David Sallee, President of William Jewell College in August, 2013, personally asking him to do what he can to divest Jewell’s endowment from fossil fuels. Dr. Sallee was very polite but unconvinced by my request. Thus, for my next step, the Hilltop Monitor, the student newspaper of William Jewell, published on February 7th a guest opinion I wrote asking my alma mater to divest. 5. Make energy efficiency improvements to your home. In November 2011, I gave a speech, It’s Easy to be Green, for my local Toastmasters group. In this speech, I went through all the energy saving tips from the October 2010 Consumer Reports to show how they could save nearly a $1000 a year. Many of my fellow Toastmasters reject the science of climate change. However, when I showed them that changing their light bulbs and weatherizing their home could save them a lot of money, they voted me as the Best Speaker for that evening. There are so many other actions you can take to reduce the impact of climate change. Let’s Take Action on Climate Change! Yes, you do matter. Yes, your individual actions matter. When you take action, it inspires other around you to take action. In the end, let’s not be like 15 year old Hazel Bryan Massery and make the wrong decision when history calls on us to take decisive action. Instead, let us aspire to be what Dr. Martin Luther King, Jr. calls us to be ‘Children of the light’. This entry was posted in Uncategorized on February 26, 2014 by bettling. Last month, I challenged myself boil down my message of climate change down to 200 words or less. I was responding to a climate change contrarian challenging me on the evidence of climate change. I wrote about this challenge in a previous blog, Explaining climate change in 200 words or less. In his Dec. 22nd letter, Ray Woodworth demanded “proof” for human caused climate change. First, The Goal of science is NOT to prove but EXPLAIN aspects of the natural world. British Physicist, John Tyndall discovered around 1850 carbon dioxide trap heat in our atmosphere which enables us to live on earth. Carbon dioxide increased in our atmosphere over 40% since the Industrial Revolution around 1850. As a result, Earth’s average temperature increased 1.5 degrees Fahrenheit or .8 Celsius since 1880. The increase of CO2 is from humans because of the isotope signature of the carbon dioxide. All this evidence enables 97 percent of climate scientists and the Catholic Church to agree climate change is real, human caused, it’s bad, and we must limit it. Yes, Earth’s history shows natural periods of accelerated climate change. However, what alarms scientists is the current extreme rapid rate of change in the earth’s biosphere due to climate change. This is why I support Citizens Climate Lobby’s proposed carbon fee and dividend. As I wrote at the end of that blog, I was very proud of the result, Explaining climate change in 200 words or less is, if I may say so myself. After I published the blog on January 3rd, I then posted around Facebook on various climate change discussion groups. I hoped the blog post and my explanation would inspire other climate change alarmists to compose their own Explaining Climate Change in 200 words or less. The response blew me away. The first person who took up my challenge was Maarten van der Heijden. He stated that he a variation of my explanation into French in about 150 words! 1 Le physicien britannique John Tyndall a découvert en 1850 que carbone dioxyde garde la chaleur dans notre atmosphère ce qui nous permet de vivre sur terre. 2 La concentration de carbone dioxyde a augmenté plus que 40 % dans notre atmosphère depuis la révolution industrielle, environ 1850. 4 Plusieurs indicateurs confirment cette augmentation de la température mondial: L’augmentation du niveau des océans, le réchauffement des océans,la réduction de la glace en Arctique, retrait des glaciers, acidification des océans, plus d’extrêmes du temps, etc. 5 Dans le passé le climat a aussi changé. Mais, aujourd’hui c’est la vitesse du changement élevé qui est alarmant. Wow! This was the first time I knew that one of my writings had been translated into another language. It was touching to see it in French by a writer expressing my thoughts their own words. It felt like I had taken a step forward as a writer into words that I cannot describe in English. “But wait! That’s not all!” As they say on those late night TV infomercials. “People seeking scientific proof of anthropogenic global climate change are barking up the wrong tree. The goal of science is not to prove, but to explain aspects of the natural world. Following is a brief explanation of climate change. Around 1850, physicist John Tyndall discovered that carbon dioxide traps heat in our atmosphere, producing the greenhouse effect, which enables all of creation as we know it to live on Earth. Carbon dioxide increased as a percentage of our atmosphere since Tyndall’s time at the beginning of the Industrial Revolution. As a result, Earth’s average temperature increased by 1.5 degrees Fahrenheit. The disturbance of the global carbon cycle and related increase in carbon dioxide concentrations in the atmosphere is identifiably anthropogenic because of the isotope signature of atmospheric carbon dioxide. We can also observe the effects of global warming in worldwide glacier retreat, declining Arctic ice sheets, sea level rise, warming oceans, ocean acidification, and increased intensity of weather events. This is a wonderful feeling that people translating my words into French and in Iowa! How about you? Can you take my words as a challenge and describe climate change in 200 words or less? It is a lot of fun. Who knows! Maybe your words will also be molded into French, Iowa speak, or some other familiar or foreign language. This entry was posted in Uncategorized on February 5, 2014 by bettling. With this in mind, for over four years now, my life’s passion is communicating about climate changeeffectively. For me, one of my ingredients for communicating about climate change effectively is using humor. 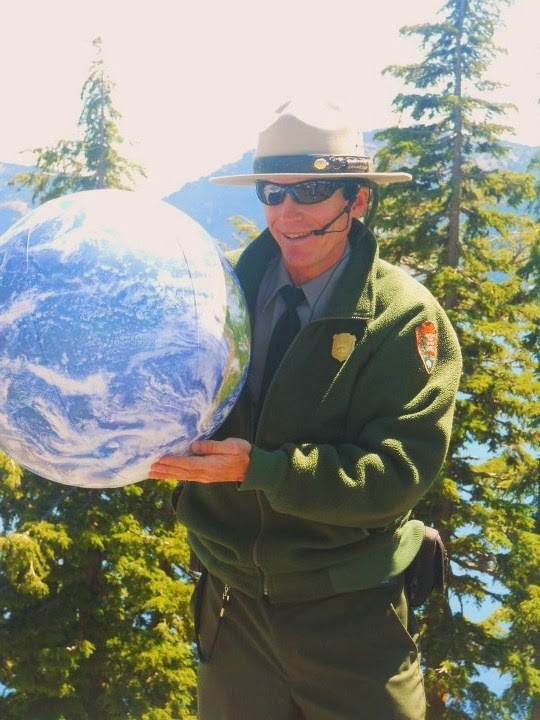 Humor is a big part of my climate change ranger evening talk that I present during the summer at Crater Lake National Park. I firmly believe that if people are laughing with me, they are more likely to be open to like listen to a controversial subject like climate change. Two years ago, The Yale Forum for Climate Change and the Media published my firsthand account of Communicating Climate change in a National Park. It is one thing to write this, however, this is science. Thus, I must show that I use humor effectively during ranger evening program. Thus, I had friends video tape my ranger talk in front a live group of park visitors on September 22, 2012. I then posted this ranger talk, The Good, the Bad, and the Ugly, on YouTube for the rest of the world to enjoy, laugh, learn, and hopefully be inspired to take action on climate change. I wanted to reach out to you because I have read about your success interpreting climate change at Crater Lake. I’ve been an interpreter for about 10 years and now am back in grad school. I gave a presentation at the NAI National Workshop in Reno last week about using in humor in interpretive programs and I show some clips from your evening program. Just wanted you to know I have been singing your praises. Keep up the good work! I hope you are well. Thanks for the inspiration. This e-mail blew me away that someone I never met or had seen one of my climate change talks in person was “singing my praises.” I had to immediately write back to him to see exactly what am I doing right. Most of us are our own toughest critics, especially me, I certainly need to know where my strengths are, so I will keep doing that successfully. Eric and I finally got to chat by phone on January 10th. This is the story he shared with me about how I am using humor effectively to communicate climate change. In 2013, Eric wanted to give a presentation to other rangers, Using Humor to Introduce Controversial Topics, at the National Association of Interpreters Annual Convention in Reno, Nevada in November, 2013. When Eric started researching humor, he stumbled across my Yale article and my YouTube video. In the Yale article, my five techniques that I listed above struck a very positive nerve with him. 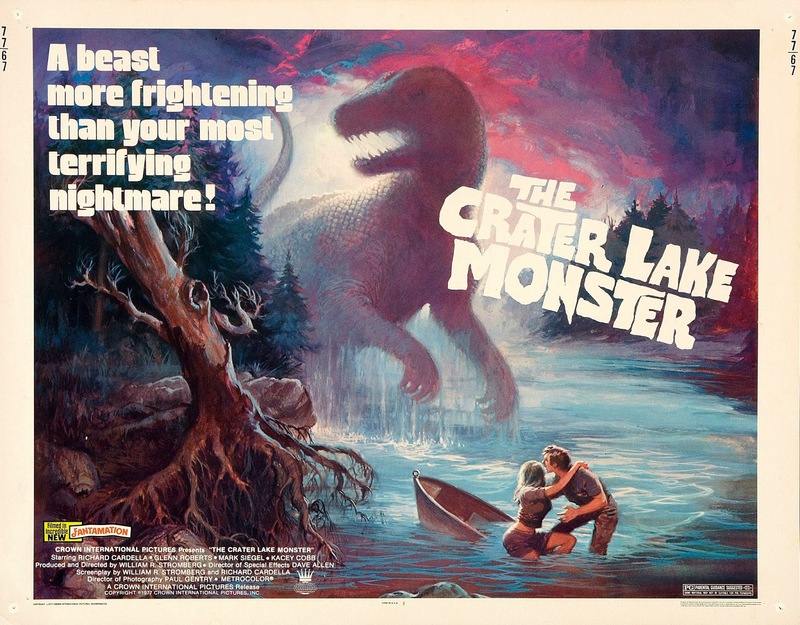 Yes, in my evening program I give sobering and unpleasant information that climate change is impacting the pristine Crater Lake, one of the purest bodies of water in the world. I show that pikas, small mammals closely related to rabbits, are losing their mountainous range and warming temperatures is a stress for them. I show that mountain pine beetles, surviving warmer winters in greater numbers, are devastating our white bark pine trees. Finally, I show that reduced snowpack at Crater Lake and the surrounding Cascade mountains is a huge concerned for the water supply for Oregon cities downstream from the park. At the same time, I am using humor throughout this talk to make the audience feel more comfortable hearing very uncomfortable information. 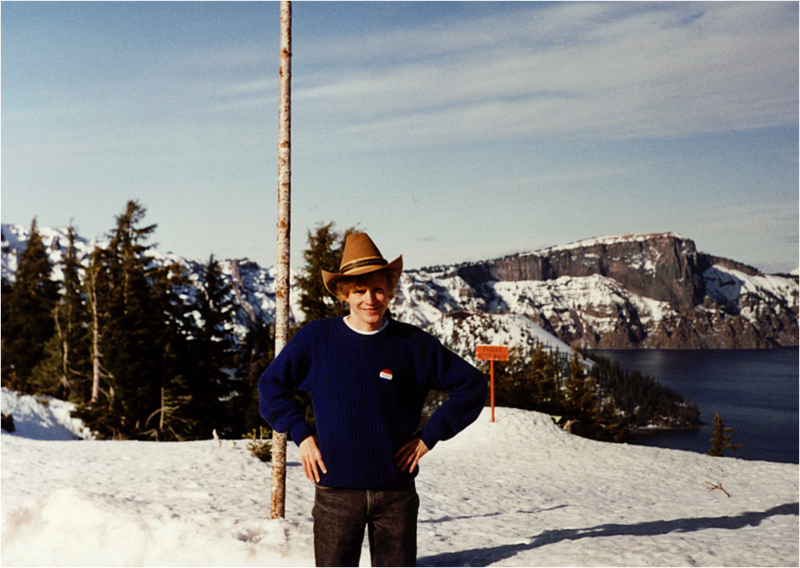 As far as using humor, Eric showed the beginning of my talk where I introduced myself with a picture when I first started working at Crater Lake in 1992. People can always relate the universal humor of vanity, over confidence, self deprecation, so these jokes have always worked for me. 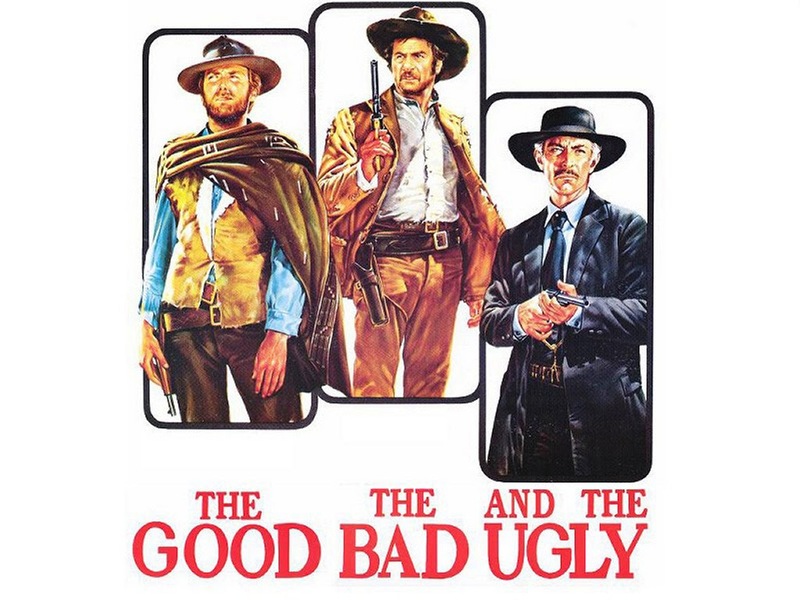 Then, I show the title of my talk, The Good, the Bad, and the Ugly. I have an image of an original movie poster with Clint Eastwood and I even play part of the theme song. It always seems like there are audience members whistling along to the music. I am excited and having fun playing the music and showing the movie image, so it always seems like the audience is ready to have fun with me. With this interaction, I basically set the tone that this is not a serious lecture. My talk is more like a Hollywood popcorn movie or a bad 1960s ‘Spaghetti Western’ that laugh along while watching. How is my humor on climate change effective? 1. My humor ‘softens the blow’ of the serious subject. 2. It endears myself to the audience and does make me more likable. 3. It introduces a theme in a more accessible way. In a second clip that Eric shows, I compare the Mountain Pine Beetles to the bad guys in the movie The Good, the Bad, and the Ugly. Just like if they were at a sporting event, I encourage my audience to boo and hiss at an image of the beetle. 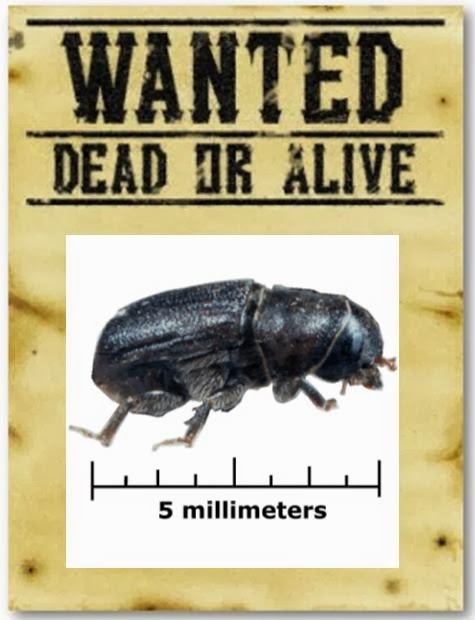 I even have the image of the beetle in the middle of an old fashion western Wanted Dead or Alive poster. The audience loves this opportunity to participate in my program and the universal feeling of rooting against a bad guy in a story. though I think it is so bad, I beg them not to order the DVD and watch it themselves, etc. The audience then roars with laughter at my strong dislike of this bad movie. Eric feels like that use of humor connect with the audience for many reasons. First, it is very memorable. Second, it is a very effective metaphor how the mountain pine beetles are attacking Crater Lake’s white bark pine trees like monsters. Eric thinks they will remember this if they go out hiking the next day and see a mountain pine beetle. They may even say, “Hey, there is one of those monsters!” and recall the information from my evening program. Eric had given this presentation at least twice. The first time was for the Regional NAI conference in Oakland, CA last April for about 25 people. The second time was in Reno last November for the NAI National Conference for about 60 people. In some ways, he felt like his presentations were like “preaching to the choir” for rangers who already successfully use humor in their talks. Like anything else, people who hate this topic tend not to come. On the other hand, Eric still feels like humor is an underutilized technique. He thinks people make the mistake of separating arts and entertainment from science. In my experience using humor to explain climate change, Eric is totally correct. People are more open to learn science when they are being entertained and they are on the edge of their seat anticipating humor. Both of us feel using humor is vital in communicating about climate change. 1. It is a local example of climate change. Studies have shown that polar bears have not been an effective image for inspiring people to take action on climate change. They live too far away in a remote, cold place that they will probably never visit. 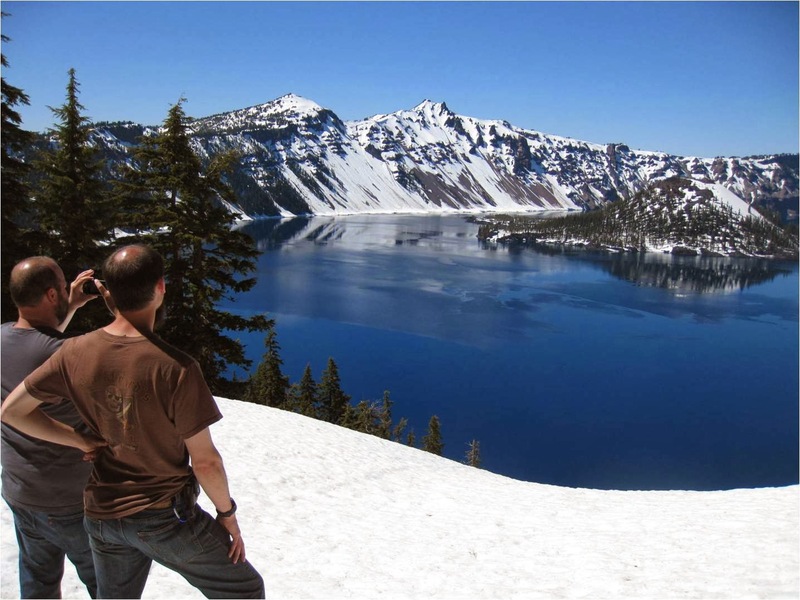 The dramatic scenery at Crater Lake creates a sense of wonder and need for protection for the visitors. They are visiting this national park, so it becomes the local environment to them. They are experiencing Crater Lake with their senses before and after my program. Many hike down to touch the water of the lake during their visit. They see the huge forest of pine trees. 3. It is immediate experience for the visitors. Hopefully, I gave the audience something they will never forget by attending my talk. Whenever I give a climate change talk as a ranger or private citizen, my aim is always to educate, entertain, and inspire my audience. I call it ‘The 3 E’ of successful presentations, even if, I know, one of them does not start with an E.
My wish is that by doing all this some members of audience will be motivated to take action to reduce the threat of climate change for my nieces and nephews. Thank you Eric Knackmuhs! You just showed me that I am effectively educating people about climate change and I am inspiring my audience with my use of use of humor. This entry was posted in Uncategorized on February 2, 2014 by bettling.